Kentucky has to win two more games to become the first undefeated national champion since Indiana in 1975-76. And if the Wildcats succeed, the stats we have suggest that they’re a notch or two more dominant than those Hoosiers were. Getting data on Kentucky is easy: The Wildcats’ every game has a digital box score that’s been compiled and analyzed by the likes of Ken Pomeroy and our own March Madness predictions. 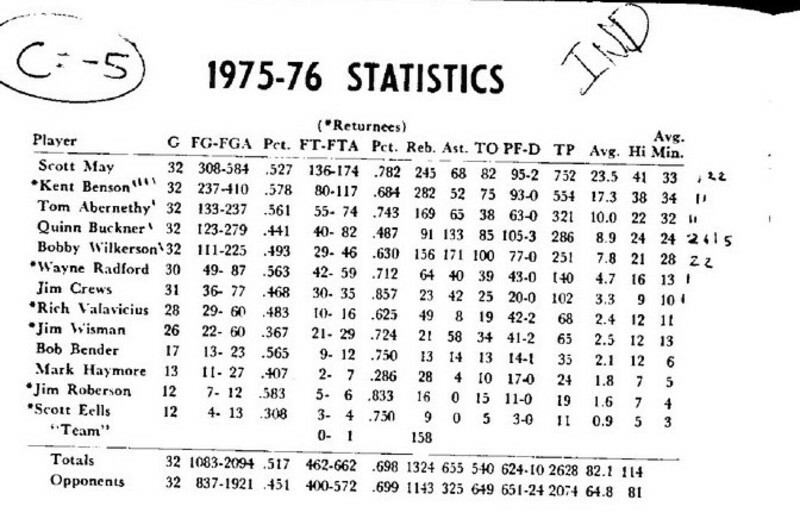 But Indiana’s statistical record from its undefeated season remains in the analog age, locked in scans of stat sheets. We also did a bit more data entry from those NCAA.org scans of old team stat sheets to compare Indiana’s core stats with Kentucky’s. Our former ESPN colleague Dean Oliver, now with the Sacramento Kings, developed four factors to describe teams’ style of play. We estimated these for Indiana,4 and we also computed each undefeated team’s pace of play and its points scored and allowed per 100 possessions. Indiana was better than Kentucky in a few ways: It allowed fewer points per possession, shot for a slightly higher effective field goal percentage, forced a greater rate of turnovers and allowed slightly fewer free-throw attempts per shot from the floor. But in every other respect, and every net measure, the Wildcats best the Hoosiers. 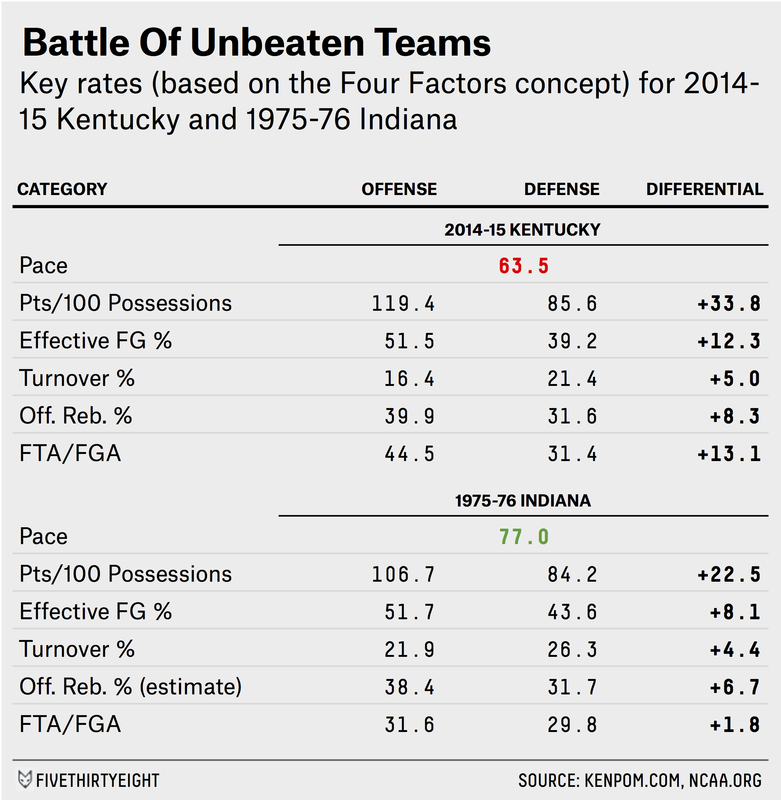 Of course, Kentucky is trying to finish as undefeated champion in 2015 — it’s not chasing the 1975-76 Hoosiers or perfection. Or, as Kentucky coach John Calipari keeps emphasizing to the media when they ask about his team’s quest to finish 40-0, “We know we’re not perfect. We’re undefeated, but we’re not perfect.” The coach is right, and he’d be just as correct if he were describing the 1975-76 Hoosiers. Both the 2014-15 Wildcats and the 1975-76 Hoosiers are great teams — probably among the 25 best teams relative to their competition in the last 40 years of men’s college basketball. But neither team ranks as the best in recent decades. What sets apart Kentucky and Indiana is that they managed to win all their close games and remain undefeated. Indiana won two games in overtime, and five more by five points or fewer. 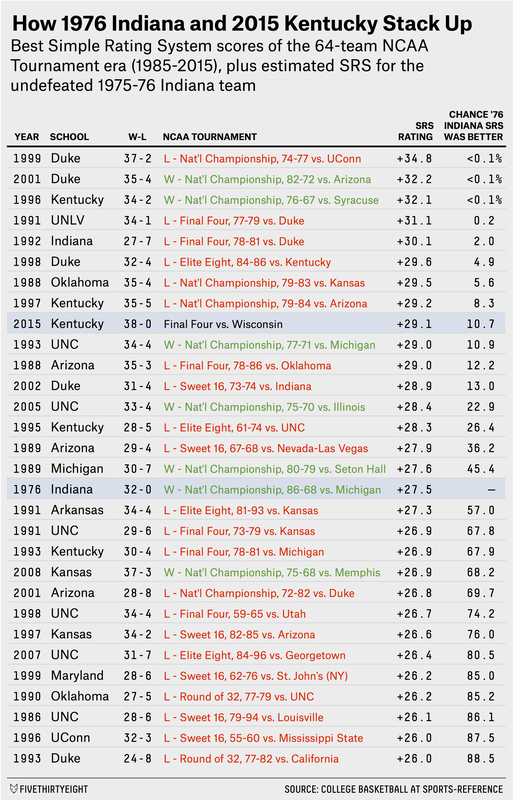 Kentucky has also won two OT games, and two other games by five points or fewer. Each team played nailbiters against Notre Dame: Indiana won by three on Dec. 11, 1975, while Kentucky won by two on Saturday to advance to this weekend’s Final Four in Indianapolis. We have reliable SRS data going back to 1985. Eight teams rank ahead of this season’s Kentucky squad, including two previous Kentucky teams: the 1996 two-loss champs, and the 1997 national runners-up. Those 1997 Wildcats — along with the No. 1 team on our list, the 1999 runners-up, the Duke Blue Devils — provide a warning to this year’s Kentucky squad that the best team usually doesn’t win the NCAA tournament. Even among the eight teams of the last 30 years that were more dominant than Kentucky has been so far this year, just two won the title. We checked how well this technique estimates SRS for teams from the Big Ten — Indiana’s conference — and the SEC — Kentucky’s — for more recent seasons. We found it’s very reliable, with an r-squared of 0.96 against actual SRS for seasons since 1984-85. The distribution of its errors is approximately normal, with mean of zero and a standard deviation of 1.26, allowing us to create a confidence interval around its predictions and estimate the likelihood that Indiana’s true SRS was greater than or less than the known SRS ratings of more modern teams. We had to guess what share of its and its opponents’ rebounds came on the offensive side of the floor, because offensive and defensive rebounds weren’t listed separately in the stat sheets that year. To that end, we estimated from trends in recent college data (paywalled) and in the NBA that 35 percent of rebounds by Indiana and its opponents were of the offensive variety.